The first and oldest running Zimmatic center pivot, manufactured by Lindsay in 1969, is still going strong and has a proud new owner. 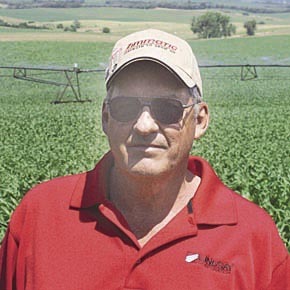 Charlie Meis of Albion, retired Vice President of Engineering for Lindsay Corp., acquired “Pivot Number One” in July of 2011 and began refurbishing the system last February. It is now in use on Meis’s farm south of Tilden. Details in the Aug. 22 Albion News Print & Electronic Editions. Charlie Meis with the first Zimmatic center pivot produced at Lindsay.